This afternoon's Wall Street Journal story (read it here—"SEC Has 'A Number' of Investigations Into High-Frequency Trading") is absolute proof that government is woefully unequipped to regulate our technological society, and that new non-governmental mechanisms are required. Do high-frequency trading firms have an unfair advantage. The morons at the SEC are years too late! 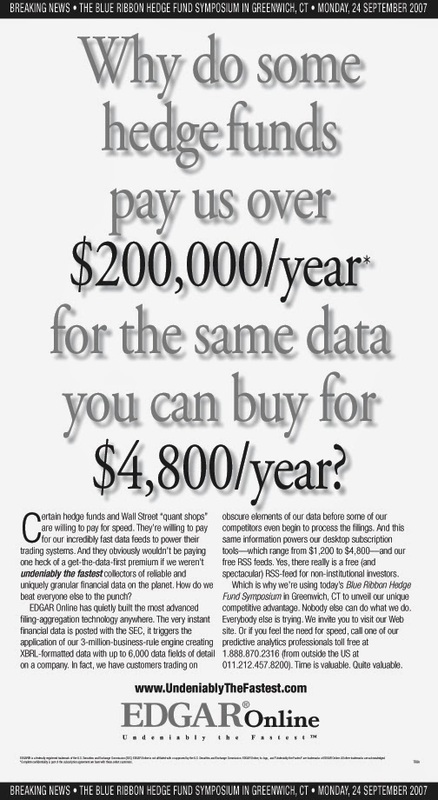 Back in 2007, I created this ad for EDGAROnline, pointing out that hedge funds paid 50-times more for data from EDGAROnline that regular customers, just so they could get it faster. Well duh! Did they have an unfair advantage. Yes. Were they trying to keep it a secret. Nope! And even if the SEC somehow figures out a way to rein in information supply, there ain't no way they're going to put the analytics cork back in the bottle. At least one hedge fund (that I know of) is using analytics on Twitter posts and they're beating the market by a long shot.